What I needed for color! Blue Phlox Plant is, as the name would imply, a blue wildflower that grows primarily in the eastern parts of North America. Found primarily in forests and fields, they grow best in full or partial sun when planted in loamy soil. Perennials, the blue phlox usually blooms in late spring or early summer, with a mature height of around 20 inches and five petals attached to a thin tube-like structure. They're most often planted for their sweet smell and the ability to attract pollinating insects, especially butterflies. In addition to their signature blue color, these flowers can also be lavender, purple, pink, or white. Wild Blue Phlox is an excellent touch to a garden. Do you need a tall flowering plant to help attract butterflies to your home or garden? This Blue Garden Phlox will suit that job just fine! These Blue Phlox bloom in mid to late summer, and have beautiful blue blossoms which bleed into a rich purple-blue around the throat. Not only does the subtle, sweet scent attract butterflies and other nectar-loving pollinators like hummingbirds, but these plants act as a food source for the caterpillars of many well-known butterfly species- maximizing your 'butterfly crop' during a blooming season! This plant can be used in some very creative ways and can also grow in a cascading appearance. 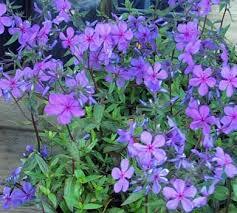 Blue Phlox Plants love being in moist, clay and loamy soil as long as they are well drained.